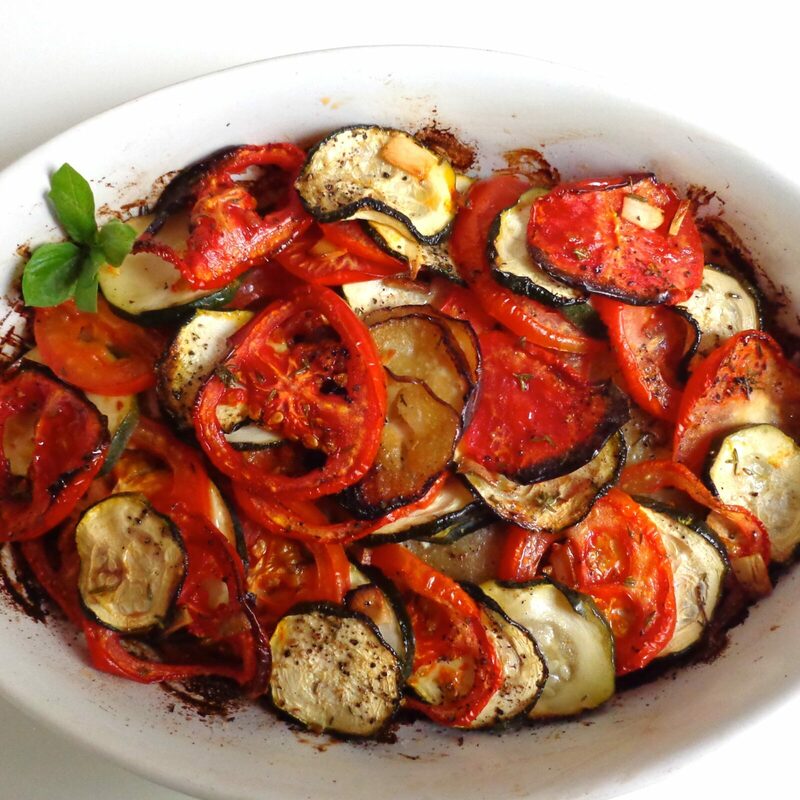 The flavors of Provence combine in this dish to create a late summer medley of eggplant, zucchini and tomatoes, sprinkled with olive oil, garlic and thyme and baked to mouth-melting tenderness. But be careful! The aromas emanating from the kitchen are so tantalizing that a taste may be requested before the dish has finished cooking. This would be a mistake, for the magic of a tian is in its slow-baked, unhurried preparation. But what, exactly, is a tian? I was surprised years ago when I first heard the word (pronounced t’-YAHN), which refers both to the food and the earthenware dish in which it is baked. It’s a word without any particular Provençal resonance, at least to my ear. And, as it turns out, the word shares a common Mediterranean root with the Moroccan stew known as tagine (pronounced ta-ZHEEN), which, similarly, is traditionally cooked in an earthenware pot also known as a tagine. Both words apparently derive from an ancient Greek word, têganon, meaning both a bowl and its contents. This being said, it is still difficult to define a tian. Varieties exist in many flavors and colors. Goat cheese is often added to the veggies — and in fact, when I was preparing the dish for this post, my daughter erupted in howls of protest because I’d made it without the cheese (I grated some on after taking the photo and rebaked it for a few minutes, terminating the crisis). Tians may be made with artichoke hearts, Swiss chard, spinach and rice, pumpkin, mushrooms, leeks, broccoli, potatoes, even pasta. Eggplant is probably the most common ingredient. Some recipes add meat or fish to the veggies, resulting in a heartier dish. A tian is usually served as a side dish, but it has enough star power to stand alone as the centerpiece of a light lunch or supper, or a vegetarian or vegan meal. This is the perfect time of year for making a tian, when tomatoes are at their reddest and ripest, and eggplants and zucchini are still plentiful. You may want to double the recipe, which serves 2, as the dish is so irresistible you may be asked for seconds or thirds! Now for some news. The cooking workshop in Mallorca, described in my last post, will unfortunately not be taking place after all. The hotel owners have decided that it would be too complicated to organize. I regret this. Many thanks to those of you who signed up, and I will do my best to organize a similar event at some point in the future. And in the meantime, happy cooking. This entry was posted in 8. Vegetables and tagged aubergine, courgettes, eggplant, recipe, tian, tomates, vegan, vegetarian, zucchini. Bookmark the permalink. Made this for supper. Went to the Saturday morning market in the 7th to pick up skinny purple Thai eggplant, bright green zucchini, yellow and red heirloom tomatoes. Fresh thyme still scents my kitchen. And I did add the goat cheese! What a wonderful aroma while this dish is baking. Thank you Meg for this perfect end of summer recipe.